When looking at commercial buildings, typically they are either built of wooden framing and brick, or wooden framing with aluminum siding. Aside from these two, steel commercial buildings are also a very popular choice. As these are the three main options, a business owner has to decide on which type of building to construct, with deep consideration of its business and operational needs. He must weigh in on multiple factors including an analysis of overall style, the building’s efficiency, its size, its customization options, and of course, the overall cost. Below is a breakdown of the key advantages of steel commercial buildings with these factors in mind. Depending on the type of business you’re in, the overall look of your building can be a highly important factor in your decision process. Brick and aluminum buildings have a decent look and style, while steel buildings are often considered as bland and unwelcoming. This may be the assumption, but is not necessarily the case. Steel buildings can be made to look just as inviting as its competition, through unique window designs, shutters, doors, colours etc. As well, steel buildings can incorporate brick on exterior walls to give steel commercial buildings a contrasting look. Steel commercial buildings can be seen as efficient in two ways. One being the efficiency of however you design your building to cater to your business operations, and the other through its overall energy efficiency and build quality. Steel commercial buildings can be easily insulated to maximize heat and cooling retention, as well as keep energy costs low. The overall size of a commercial steel building is up to you. It can be as little as 30’x30’ or as big as 100’x200’ – sizing options revolve around what your business needs. 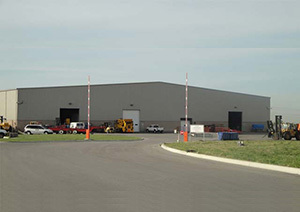 These buildings can be large enough to accommodate large machinery, vehicles and other business specific equipment. The great thing about a steel commercial buildings is that due to the many steel truss and beam designs, buildings can be constructed taller and stronger to support unique commercial demands. Steel commercial buildings are highly customizable, more so than brick or aluminum siding builds. There are options for generic kit buildings, as well as the option to fully design your own structure from the ground up. You decide on every aspect of your construction, and the end result is a commercial space that fits all your business needs. The cost of a steel commercial building is dependent on the above factors, including size and customization options. Generally, the final cost is comparable to brick or aluminum buildings, but can often be the more affordable option. Companies offer free quotes to help you in your decision process, so make sure to take advantage of this feature and become better educated on your options.